MIND READER (The Anomaly Trilogy #2) by author Anna Hackett is a fantasy novel released in October 2012. Mara Ross didn't trust anyone after being let down numerous time. She was thrown out of her house and called a freak. She had the power to raid mind. But she swore to save other anomalies like herself from villains and government agencies. Some villain was after anomalies to perform experiment and use their unnatural power for his own benefit. Callahan was ex CIA and already undergone experiments to enhance his powers. And believing he was protecting his country, he had killed. Now he had made a safe haven for other anomalies to live peacefully. So when Mara went to save Cate and walked into a trap, Cal saved her. The attraction simmering between them took over. But would Cal let it? After all he believed himself incapable of love. Having read Part I of Anna Hackett's Anomaly Trilogy, I was ready and wiating for this one. No, it didn't disappoint. 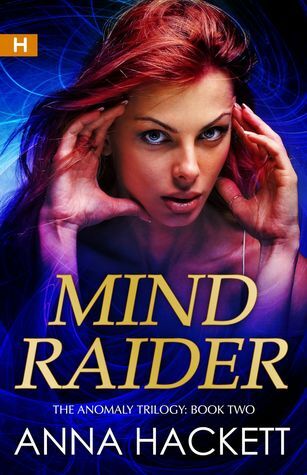 This second part of the trilogy focusses on Mara, who can literally raid the mind of her victim. Anomalies are human beings with highly dangerous supernatural gifts, which can be used for good or evil. Unfortunately, having so much power has made them susceptible to terrible danger, as evildoers try to trap them and use them for their own selfish ends. The story focusses on Mara's relationship with Cal, another Mind Raider. Cal dedicates his life to building a haven for anomalies and keeping them safe. As Mara senses her growing attraction to Cal, will he let her come close? Realizing long back that he had the power to hurt other humans badly, he literally keeps his distance now, fearing the idea of coming close. As the Anomalies band together to rescue Cate, one of their number who has been kidnapped by master criminal Gabriel Levin to empower him to do eve more evil, Mara and Cal have to work out thier differences. I have to say that the love scenes are pretty hot and are written in the language of erotica. So don't say you weren't warned. A short but immensely satisfying read, it held my interest all though.